An image of Pluto and its moons taken by the Hubble telescope. With a freshly translated volume of Karl Ove Knausgaard’s My Struggle recently released, and critical speculations abounding around similar work (“The question isn’t why serious writers have turned to the memoir-novel, but how they could be writing anything else.”), the case for fiction is deserving of all the reconsideration and skepticism it has lately received. But too often scrutiny is confused with outright renunciation, and the stage is set for new works of fiction to arrive with a reception of wary indifference. This makes it all the more noteworthy when something invented does manage to stand out. Amidst all the popular momentum toward memoir, one novel released in recent months has been consistently championed by reviewers even though the biographical life of the author did not play a central role in its construction—Preparation for the Next Life by Atticus Lish. It has been called a “necessary novel” that, according to a writeup in The Nation, renders into daylight “the edges of New York City where the Third World still persists.” Lish has been lauded in the New York Times for his “intricate comprehension of, and deep feeling for, life at the margins,” and likewise in The Guardian for his “determination to narrate America from the bottom.” Yet for however much this story of failed love between a wounded veteran and an illegal immigrant smacks of authenticity, its author seems to have done precisely what has been cast as no longer possible, creating an immersive world that is fundamentally a fabrication. The success of this novel beckons a closer look at the most consistent sentiment voiced by its reviewers—that it just feels so different. It may be fair to expect a touch of grit from our storytellers, fruits of a few years slumming it after college, but eventually this levels off, happily settling into the range of minor violences scattered across the ordinary, biographical life. Leave the stories of ex-Marines self-medicating into oblivion, or central-Asian muslims harried by the Patriot Act, like the novel’s Bradley Skinner and Zou Lei, respectively, to journalism and confessional literature. Lest opaque figures like these be essentialized and misrepresented. In this vein, the 20th-century suspicion of grand narratives, despite proclamations like Jonathan Sturgeon’s at Flavorwire that “[t]he postmodern novel is dead,” still holds sway. And it seems much more in reaction to postmodern social discourse that the memoir-novel has emerged: a hyper-local account of actual life that must be confronted as it is experienced, not as political fictions would have it spun. This is posed as a positive antidote to the unappealing complexity of the narrative modes which characterized turn-of-the-century fiction because, as Sturgeon claims, “the life of the author is now the novel’s organizing principle.” Fiction fiction, organized around characters who don’t actually exist, seems now to be the exclusive purview of not-so-subtly commodified, formalistically sophomoric genre franchises — backward looking, oh so TV-adaptable sensationalizations of medieval intrigue, monster folklore, and rehashed 20th-century dystopian schemata. How’s it goin? he asked. It’s goin. She was holding her cigarette up by her cheek, resting her thick elbow on the table. You made it here okay then? You mean like finding the house? Coming here and finding the address, yes. Yeah, obviously, he said. That was nothing. Well, I ask because it sounded like it was going to be a problem. It’s a long way for some people. As long as I know where something is, I know eventually I can get there. Well, like I said, you made it. The resemblance is certainly striking, but calling this a novel of resuscitated modernism is to be willingly misled. David Foster Wallace lamented years ago, in his now canonical essay E Unibus Pluram: Television and U.S. Fiction, of “the self-conscious catatonia of a platoon of Raymond Carver wannabes,” and Lish of all people is careful to avoid resetting this trap for himself. While at first glance the prose and structure of his novel may seem to ignore the cultural primacy of Wallace, Don DeLillo, and Thomas Pynchon in the years between high-modernism and today, on closer inspection Lish presents us with something much trickier, and much more an immediate descendent of the bunch. What on the surface reads as Lish’s direct influence by modernism is really a ruse fellow novelist Tom McCarthy calls “[t]he real…pretending to be a fake that is pretending to be real.” What, then, is being related so faithfully after all? Preparation for the Next Life’s readers may be freelancers, hold a degree or two in the humanities, and live in a neighborhood replete with dedicated lifestyle blogs, but we won’t find ourselves in this book. The charming self-awareness of Bushwick may only be a few geographical miles away from Flushing, where most of the story takes place, but the text’s foreignness shows us the underside of so much global interconnection—that there are terms to the conquering of distance which brings disparate people together. While the technology exists to preserve the emotional intimacy of people a world away as never before, the flip-side of so much relativized relationship is the potential for an unprecedented degree of alienation between people in the same location. No longer does a distant and discrete Third World chafe against the First, but rather the conflict is diffused throughout, present in the harsh juxtapositions at any point across the network, though without the clear boundaries that once gave it a coherent character. As Michael Hardt and Antonio Negri forecasted in the post-Marxist classic Empire, the waning of industrial production implicit in so much connectedness means a fundamentally different conception of localized community — regarding its subjects, an “increasing importance of immaterial production [has] tended to free capital from the constraints of territory and bargaining.” Likewise, the more social relations are determined by collectively produced virtual networks, the less they are coordinated by fixed material features. This makes undreamed-of levels of global solidarity possible, but it also makes the situation of the already marginal, who lack proper access to the network — like Lish’s characters — that much more tenuous. This is why ‘common languages’ are so central to Hardt and Negri’s model of an emancipatory commons, because without them, what was for Marx only a dire fantasy in the Paris Manuscripts finally rings true: the subject will “fall from his filled void into the absolute void — into his social, and therefore actual, non-existence.” It is precisely in this sense that Lish’s cast of personalities never becomes entirely legible. We are forced instead to accept unstable subjectivities, prisms of trauma and insufficient language, drifting through events without a tidy sense of gravity, without ever fully emerging as characters. Living as we perforce do in a manufactured and artificial world, we yearn for the ‘real,’ semblances of the real. We want to pose something non-fictional against all the fabrication — autobiographical frissons or framed or filmed or caught moments that, in their seeming unrehearsedness, possess at least the possibility of breaking through the clutter. More invention, more fabrication aren’t going to do this. I doubt very much that I’m the only person who’s finding it more and more difficult to want to read or write novels. She stroked his now-cropped hair. She nodded, gazing down at him. People got on all around them as the train went down the line. They got on carrying their food, a bundle of parchment cornhusks like dried rattlesnake skins. Through their bags you could read the words Aztec Maize. Everyone sat all together around them, pressed against her side, wedged in at the end of Skinner’s feet. He moved his feet for them, to not step on them. Zou Lei rubbed his ears between her fingers. They rocked with the train. Both of them dozed, people’s legs bumping against their legs. Other people dozed as well, tattoos of crosses on their knuckles, the word Serena in italic script on the inside of a pregnant woman’s wrist. They went back to his room, he was very nice, and she fell asleep on him while he smoked a Marlboro and when the night came she didn’t want to leave. Representations of the solar system often depict a planet’s moons as though they twirl around their host like a ball around the center of a roulette wheel, conquered by the larger’s mass. The planet itself appears fixed in its steady arc, and all the smaller stuff just buzzes around. But this is a fiction. 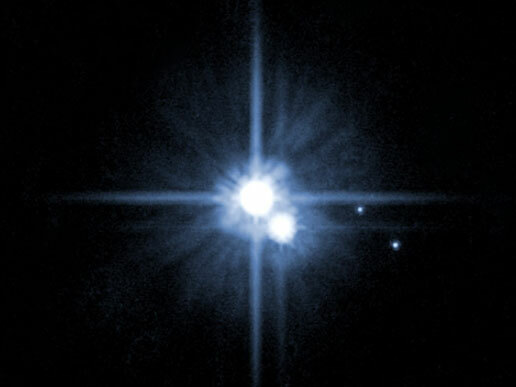 Hubble observations of Pluto in 2006, which led to its reclassification as a dwarf-planet, showed it wobbling with its moons around an empty space, the center of mass of a system of celestial objects in which it simply happens to be the largest. Despite its relative size, the gravitational center of Pluto’s trajectory is dislodged by its satellites outside its body. In truth, any object hosting the orbit of another is engaged in a dance like this, even in cases where the difference in mass is quite large. The earth too, entangled with the gravity of its moon, rotates around a barycenter, as it’s called in astronomy, a few thousand miles off-center. It’s just that, from here on land, it doesn’t look that way. In contrast to the epic formula of Knausgaard, where motives are exhaustively laid bare, such that characters surrounding the author are either entirely present or altogether absent in their influence, there is an oppositional manner of composing realities, in which even if a character is missing from a certain scene, as Auerbach notes, “the influence of his will and his feelings continues to operate.” In such a world, the trajectory of any one character, however prominent, never escapes being warped by the gravity of another. Even if, as in Preparation for the Next Life, these background figures are no longer alive. Just as marginalization cannot reduce them to zeroes, neither do destruction and disappearance — Skinner’s friend Sconyers, mortally injured in the same blast which leaves Skinner permanently disfigured, and Zou Lei’s father, whose life is mysteriously sacrificed in “a war to modernize” for the Chinese military, haunt the story constantly. And likewise, with this remainder of narrative mass looming in the background, no one ever quite manages to take charge of events. The weightless occasionally flicker into form, and so too are the main actors subject to sudden disappearance. Nothing can be traced independently, disentangled from its distorting factors. A continuous self, around which all events are organized, is impossible in this reality. [I]n the context of communicative and interactive production, the construction of concepts is not only an epistemological operation but equally an ontological project. Constructing concepts…is really an activity that combines the intelligence and the action of the multitude, making them work together. Constructing concepts means making exist in reality a project that is a community. A key word in this formulation is ‘combine.’ Disparate elements are brought together, and something more than the sum of their parts emerges. Any realism this collective juxtaposing smacks of is, as Auerbach understood decades ago, “merely a means, not an end,” which it readily dispenses with as need be in its orientation toward the truth. And what is true, in the positive, Foucauldian sense, is not what we reveal by laying everything bare, but what we actively construct to better serve our values. Likewise, one of McCarthy’s key motivations for calling the contemporary author a ‘writing machine’ is a new kind of production that is altogether industrial, or post-industrial, in its general bearing — a final shove away from the rather pastoral imperative that, as he writes, “novelists should ‘discover’ or ‘intuit’ or ‘reveal’ reality: they must invent it. Reality isn’t there yet; it has to be brought forth or produced; and this is the duty and stake of writing.” Thus what is called for is not the novel’s abandonment, but rather an even deeper descent into the radical historicity of postmodern literary assemblage. It would be a mistake to say that this is solely a work of imagination. I plucked most elements from the world around me. I know what it’s like to be arrested. Parts of the immigrant house Zou Lei lives in when she arrives in New York were based on a place a guy took me to in Flushing. I also lived, though not for long, in an immigrant house in Boston’s Chinatown. I saw up close how the living quarters are like a changing room where the ceiling is open and the guy in the compartment next to you is breathing a few feet away. Other parts required different research, as I’ve never experienced war directly. One thing that inspired me was the memoir House to House by Sergeant Bellavia, recounting his experiences in Fallujah. I also interviewed a lot of people. The NYPD does not want to talk to you, by the way. I spoke with a number of soldiers and lifted a phrase from a vet I met in the Atlanta airport: “turn and burn.” Some people’s voices got in my head. Mrs. Murphy’s voice was clear in my head, and I had a few people I had the luck of overhearing. I heard two guys talking on the subway coming from Coney Island, and there’s no way to describe their conversation except to call it mayhem. While this is still necessarily a work of fiction, in that all these voices were brought together where they never coexisted before, this inventive compiling does more than simply replicate the sensation of our subjectivity, as Sturgeon reads the earlier postmodern assemblers, “drowned in a system of disinformation, paranoia, and entropy.” For something so disjointed and random, the experience of reading this novel is startlingly real. And not for its inclusive, Knausgaardian cataloguing of what Lerner sees as “vast quantities of essentially undifferentiated material,” which pantomimes the flatness of life when it has no realities imposed upon it. Rather this fiction is a challenge to life itself, to find a way to hold the narrative pieced together with recombined fragments of its own body. It seems almost tyrannical in this demand, especially when we struggle to assimilate its more traumatic moments. Auerbach’s notion in Mimesis looks, in this regard, less moderate than it is typically remembered: “the new and strange world which now comes into view and which, in the form in which it presents itself, proves to be wholly unutilizable…must be so interpreted that it can find a place there. But this process nearly always also reacts upon the frame, which requires enlarging and modifying.” This reality acts as a kind of inflexible crystal, forcing the world to rearrange around it upon its introduction. She withdrew and they stopped kissing for a moment. She gave him a little push to turn him so she could examine him in the lamplight. He said oh that. She hadn’t known what it was, had not connected it to the war. She had thought it was a birth defect or a contagious disease. You can’t like catch anything from it. She said okay. She touched it. The tissue felt cold. She laid her palm on the dented puckered slick bumpy knotted flesh. You get in the war? She made a tsking sound. They shoot you in the body? Shrapnel, he said, his back to her in the lamplight. Here is as close as the novel gets to a Beckett-like unnameable, where the grammar breaks down before the imprint of the horror can be fully transcribed. Skinner himself, like the novel, is a kind of writing surface, etched with a violence that continues to replicate itself long after the initial act is over. Zou Lei tries to touch it, to transform it under her loving caress, but the scar remains inscrutable, resistant to language. So too are the seams between all the appropriated moments of the book obscure, awkward places, where the motion of the story threatens to halt. For these passages to be rendered sensible, the world must move with them. Maxwell Donnewald helps produce the magazine n+1. Poems of his have recently appeared in Perfect Wave, Vol. 3. He will be traveling through Europe this autumn on a fellowship from Hunter College.